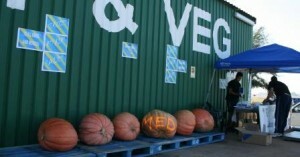 2013 Standard Bank / Livingseeds Giant Pumpkin Competition @ The R59 Shed. Saturday the 6th of April saw the culmination of a whole season’s worth of work for many of our competitors in the Standard Bank / Livingseeds Giant Pumpkin Competition at the R59 Shed. Wow, what a day it was, the excitement started building from early in the morning when the first competitors started dropping their entries off. First let me go back a few months and give you some background on this competition. John McChlery is the MD of Green’s Greens, a major supplier of farm fresh veggies to all of the supermarket groups. John was the brain behind this competition. He likes to deny it and push others to the forefront, however this competition would never have gotten off the ground without his dedication and effort. This competition was made possible by the generous support of Standard Bank who put up the main prize money, and arranged for numerous activities and goodies for the kids on the day, as well as all of the eye-catching banners that lined the R59 Highway, and created an air of festivity within the R59 Shed. 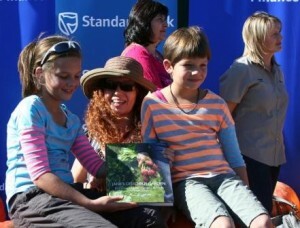 Without Standard Bank we would never have had such a successful competition. Everyone at The R59 Shed, Green’s Greens, Livingseeds, and Talborne Organics are honored to have Standard Bank as our headline sponsor. So back to the day under discussion. The first few entrants, lined up. Saturday dawned bright with the blue Standard Bank banners very effectively painting our section of the R 59 blue. Everyone that drove past us knew that Standard Bank had something big going on here. The day started off a bit slowly and by 10:00 we only had about 8 or 9 pumpkins lined up outside at the weigh-in station. This did lead to a bit of concern amongst the organizers. Thankfully we were soon inundated with people dropping their prize-winning hopefuls off, and we had at least two stages where we had a few cars lined up with giant pumpkins ready to be offloaded. The Weigh-In Station was managed by the very capable guys from Scale Tronic Services who had a selection of scales there to handle everything up to a 600Kg behemoth, unfortunately that scale was never tested to its full capacity. We are however hoping that in the next year or so we will be doing a bit of limit testing on a few of Scale Tronics’ wares. It was really comforting to note that these guys had SABS approved certificates for their scales available for anyone that queried the veracity of their instrumentation. 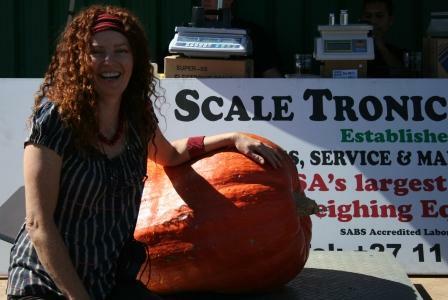 And naturally one or two people did query the reliability of the two scales used to weigh the pumpkins. 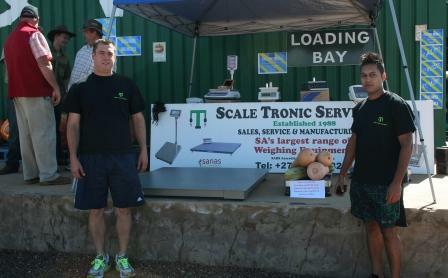 Dawie Nortje and Ashish Mahase of Scale Tronic Services oversaw the critical element of weighing all the entries, and did an exceptional job of doing it quickly, accurately and correctly. Talborne Organics has been a very supportive sponsor from the first day. In September 2012 they supplied organic seed starter packs for all the competitors, and I know that many of the competitors used their products to either feed or protect their precious giants. Talborne Organics also supplied prizes for every prize category in the competition. At 12:00 we started the official weigh-in process and all entries were carried onto the main platform for weighing. All entries were weighed on the same platform scale to ensure that no discrepancies or challenges were possible. A total of 49 pumpkins were entered into the competition. 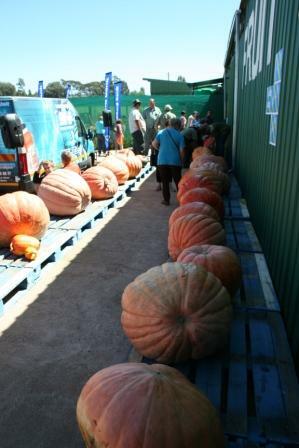 This being our inaugural competition, every single entrant was a first time Giant Pumpkin Grower, we are very proud of the effort made by each and every entrant. To all of the entrants, Thank you guys!!! It is your effort over the last few months that made this day a success. To this end we had a number of smaller prizes that were awarded in various categories to ensure that people were recognized for their efforts. 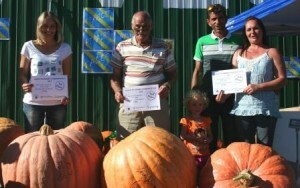 In total 49 Giant Pumpkins were entered. Here are a few interesting facts of the day. 3) 2142.30 was the total combined weight of all of the pumpkins entered. 5) Over 20 pumpkins were donated to various schools, charities and churches in the area to help feed the underprivileged. 1) 111.80Kgs Entered by Shirley Olivier. It can be seen that the competition was tight and there was very little spread between 1st and 3rd places in both categories. Smallest Giant Pumpkin went to Letsema Home School with a “little giant” of just 9.2 Kgs. We sent Gardening Celebrity Jane Griffiths along with Claire Slabber from Talborne Organics to select 2 other pumpkins for us. We asked that they choose pumpkins to fulfill the roles of Prettiest and Ugliest pumpkins for our competition. So, as ladies are want to do, they came back with three pumpkins and demanded that we add a third category for the Most Unique pumpkin. These are the three pumpkins that were chosen. We also had a very well support “Guess The Weight” pumpkin. My son Daniel managed the table and solicited ‘guestimates’ from passersby. They had to pay R10.00 for the privilege of potentially winning a R500.00 prize sponsored again by a very generous Standard Bank. The pumpkin was weighed immediately after a witnessed calibration test, and weighed in at exactly 71.8 Kgs The closest ‘guestimate’ was 72.00 Kgs and the winner of that prize was a very happy Jane Griffiths. A total of R800.00 was raised for the Sukasambe Children’s Home on that competition alone. A very happy Jane Griffiths and "THE" guestimate pumpkin. As the organizers we would sincerely like to thank every competitor that entered, we know of a number of very worthy entries that split and were ineligible or broke open and thus would have been disqualified. To the entries that were able to bring a pumpkin in on the day. THANK YOU! 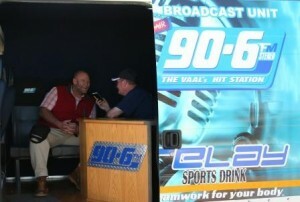 Every one of you are very much appreciated, it was you that contributed to the fun and excitement of the day. We trust that we will see you again next year for round two. I have spoken to a number of the entrants and they are already making plans for the next competition, we have some people already building huge compost heaps now, to ensure that they have enough food to feed their own Giants. Everyone that I spoke to recons that they know how to improve their sizes, and will definitely be fielding a bigger pumpkin next year. Finally, it must be remembered that this is a community competition. All of the proceeds from the competition are donated to two of our local charities the first being the Sukasambe Children’s Home that assists mentally and Physically disabled children that have been abandoned. The Second Charity is Dolly’s Old Age home in Penvale. Without your support, it would not have been possible to donate over R9000.00 to charity. If you would like to sign-up for the 2014 Standard Bank / Livingseeds Giant Pumpkin Competition @ the R59 Shed please click here. Note that registration is from September 2013. 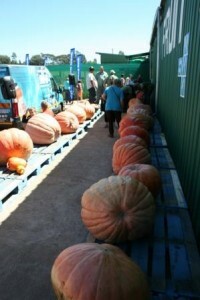 Note: The three winning pumpkins will be on display at the R59 Shed until the end of April. Please Pop-in and come see what our winners grew.